17/10 Concert at Napa bar and Gallery, Prague (CZ) 21h. 05/07 Outdoors concert chill out at Stomovka Park, Slechtovka. Prague (CZ). 26/06 Fusion with percussions, Joy cosmopolitan, 20h30 Prague (CZ). 21/06 Fusion with percussions, outdoors town hall square 18h , then inside 20h, Ceske Budejovice, (CZ). 13/06 Jazz/ latin / acoustic Napa gallery,21h Prague (CZ). 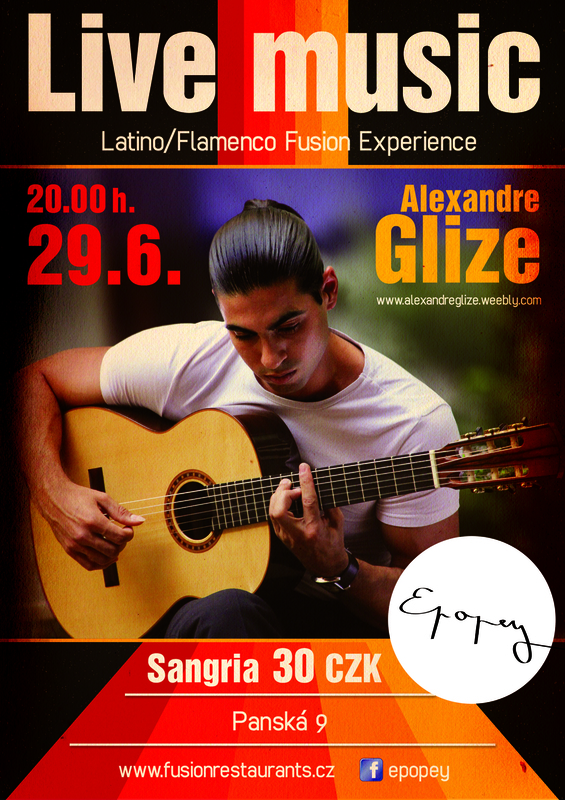 06/06 Jazz / latin /acoustic and jam, Café Blatouch, 20h, Prague (CZ). 24/05 Jazz / latin /acoustic and jam,Korso Krymska fest, Prague (CZ). 25/04 Jazz / latin /acoustic and jam, Café Blatouch, 20h, Prague (CZ). 31/12 Private concert for "royal wedding company".